> It looked like Shaun Marcum was going to have a solid return from the disabled list tonight, but his defense had other ideas in the Brewers’ 4-0 loss to the Pirates. All four runs came in the fifth inning, none of them charged to Marcum. Carlos Gomez started the inning by dropping what would have been a routine line drive out, and instead allowed Neil Walker to reach. Of course that run had to come around to score, as Michael McKenry doubled two batters later. Then Marcum let his frustration get to him, allowing three straight RBI hits to Jeff Karstens (the pitcher), Jose Tabata, and Travis Snider. The Brewers never really posed much of a threat against Karstens all night. They got back-t0-back singles against him in the eighth inning before he left with an injury, but the Pirates’ bullpen bailed him out. > I haven’t seen anything in Jeff Bianchi. He got two hits in final two at-bats tonight, but had been 0-f0r-18 prior to that. He also made an error behind Marcum (he should have had three errors, actually). One of them came when he completely missed a cut-off throw from Norichika Aoki (it wasn’t the greatest throw, but there’s no reason he couldn’t have caught it) in the third inning. Then he botched another cut-off throw in the fifth, which definitely should have been an error. The only error he was actually charged with was a Yuniesque play in which the ball went under his glove on a routine play. In other words, he’s basically been a Brooks Conrad 2.0. Maybe Jean Segura was unavailable tonight (or Ron Roenicke was giving him a “breather”), but I don’t want to see much more of this guy at shortstop. > Marcum didn’t throw the ball too bad at all for his first start since June. He gave up a few hard-hit balls here and there, but definitely didn’t deserve this fate. 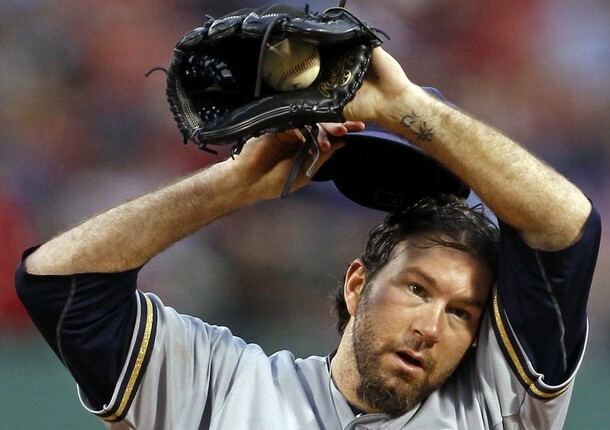 > Bullpen coach Lee Tunnell is confident that John Axford will get back to his former self eventually. If you didn’t know, Tunnell was named the bullpen coach after Stan Kyles was unfairly fired. > The Brewers outrighted Mike McClendon to Triple-A to make room for Bianchi on the roster. > The huge blockbuster trade between the Dodgers and Red Sox was approved today. Adrian Gonzalez, Carl Crawford, Josh Beckett, and Nick Punto will head to LA in exchange for Rubby De La Rosa and four other Minor League players. > Zack Greinke had his first legitimate good start for the Angels yesterday, going 7 2/3 innings while giving up one run against the potent Tigers lineup. > The Brewers out-hit the Pirates 9-7, yet were shut out and lost by four runs. > Brewers pitchers didn’t give up an earned run today. It’s the worst nightmare for every sports station: ESPN, FOX, all of them. There aren’t any teams from the east coast in either championship series. So that means TV ratings are going to be down! It’s the apocalypse because the bandwagoners won’t be watching! HELP! I honestly could care less. I say screw the east and their gigantic payrolls. None of the top nine payrolls in baseball made it out of the NLDS, which just proves that having a big payroll doesn’t mean anything. Actually, I’d be lying if I said it doesn’t mean anything- it means that you have the power to overpay worthless players to underperform for your team. Yes, I’m talking to you guys, John Lackey, Carl Crawford, and so on. But if you’re not on the bandwagon of the Yankees or Red Sox, then here’s what I have to say to you: welcome to the midwest. You’re going to be here awhile. That’s right. The only one even in the top 1o is the Tigers, and that’s saying something, considering Detroit isn’t a very big market. But this just hasn’t been a good year for any east coast team, which, in my opinion, is exactly what baseball needed. The Yankees’ offense became too inconsistent in the ALDS against the Tigers, and that wound up costing them. The Red Sox had a historical collapse, as the entered September with a nine-game Wild Card lead, and blew it. The Braves also blew a big lead of their own, as they had an eight-game lead in the Wild Card, and blew that. The Rays, who had so much momentum coming into the postseason, were made fools of by the Rangers. But the biggest one was the Phillies- they won a franchise record 102 games, and yet couldn’t make it out of the NLDS against a Wild Card team (the Cardinals). And the Phillies’ season ended on a rather fitting note. As Chris Carpenter induced a Ryan Howard groundout to finish his shutout and advance his team to the NLCS, Howard could only limp out of the batter’s box, and collapsed about a fourth of the way to first base. While the Cardinals celebrated in the middle of the infield, medical trainers rushed out to see what happened to Howard. A few minutes later, the helped him off the field. But, earlier today, it was revealed the Howard ruptured his left Achilles, which is a tendon on the back of your foot. It was also said that Howard won’t be back until May or June of next year. But at least the Phillies know that their team is going to fail next year beforehand. The Phillies were expected to win it all this year, like they are every year. And they never live up to those expectations. If you’ve been following this blog for awhile, you know that I absolutely hate the Phillies. So thank you, Cardinals. But now, let’s get on to what matters. The teams with arguably the most bad blood between them this year are facing off in the NLCS. The Brewers and Cardinals have hated each other all year, and it may already have stirred up even more before the series even started because of an interview earlier today. You can see the entire interview here, but this was by far the best part, and I found it hilarious and true. Carpenter is a good pitcher and all, but his attitude is pretty bad. And I don’t see why a veteran like him should be acting like that. But this will make the series interesting right off the bat, which is what I want to see. By the way, Yovani Gallardo will be starting Game 3, Ron Roenicke announced earlier today. He’s also going to start in the event of the possible Game 7, but I’m not comfortable with him starting either- Yo is 1-7 with an ERA of nearly 6.00 in his career against the Cards.